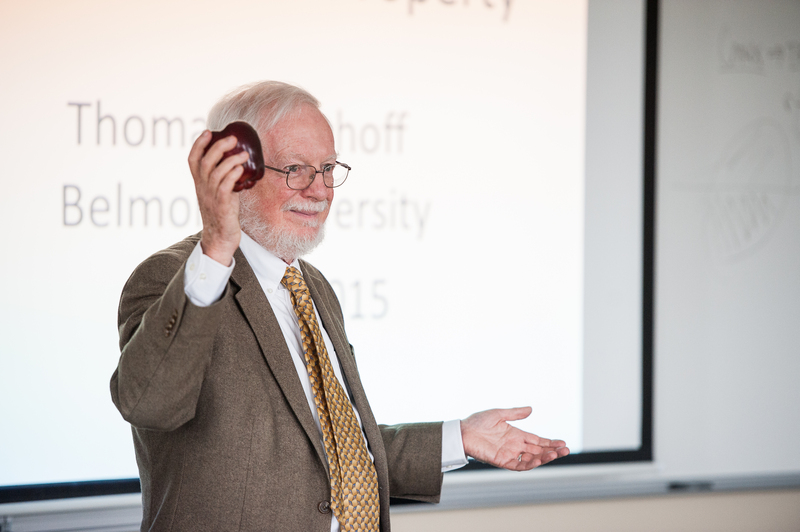 Geometer and Professor at Brown University Dr. Tom Banchoff, a mathematician known world-wide for his specialization in the fourth and higher dimensions, recently gave two presentations at Belmont. Dr. Banchoff is a pioneer in applying computer graphics to the fourth dimension, thereby permitting illustration of this illusive and abstract concept. The first talk, “Math Spans All Dimensions: Guides to the Fourth Dimension” was based on the interactive poster developed for Math Awareness Month in 2000 while Dr. Banchoff was president of the Mathematical Association of America. In our familiar three-dimensional space, visualization is an important tool. In our age of computer visualization, we can now explore phenomena in our “nearest neighbor,” the fourth dimension. Guides in this effort include Edwin Abbott Abbott (“Flatland”), Madeleine L’Engel (“A Wrinkle in Time”) and Salvador Dalí (“Corpus Hypercubus”). The second talk was titled “The Two-Piece Property–the Geometry of Slicing Fruit” and addressed questions including ‘What can we say about objects that fall into at most two pieces when we slice them with a long knife?’ and ’How can a topic that we can describe in simple language lead to a Berkeley PhD thesis?’ The “two-piece property” turns out to be equivalent to minimal total absolute curvature, a classical topic in differential geometry that yields surprising results when we ask the same questions for polyhedral surfaces, in three-dimensional space and higher. To see more images from Dr. Banchoff’s presentation, click here.